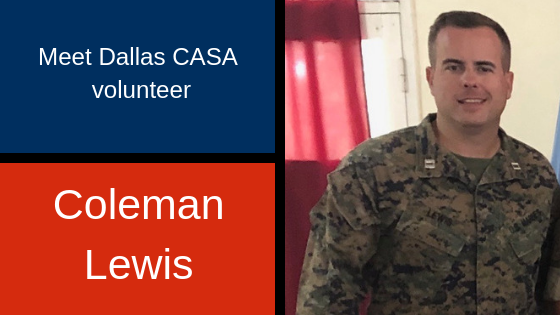 For Dallas CASA volunteer Coleman Lewis, a recent deployment to Central and South America with the U. S. Marine Corps Reserves gave him a new perspective on child welfare cases. After four years of active duty with the Marine Corps, including a tour in Marjah, Afghanistan, Lewis joined the Marine Corps Reserves in 2012. He was working as Power Procurement Supervisor at Pioneer Natural Resources in Irving in 2018 when he received the call to deploy to Central and South America. Leaving friends, family and his job behind, Lewis served as a U.S. military advisor in Belize, Peru, Brazil and Argentina. In Belize he assisted local police and military in their battle against narcotics, human trafficking and contraband and prepared them to serve in United Nations peacekeeping missions. In South America he taught martial arts and trained local military on tactical employment of vehicles in both urban and amphibious terrain. He says the poverty and violence he witnessed gave him a new sensitivity to the circumstances people are in. Where before he might have judged a family’s choices, he says he hopes what his experience taught him is to be more sensitive to circumstances as well. When poverty and violence surround you, he said, making different choices may be almost impossible. A native of Dallas and graduate of the University of Texas at Austin with a bachelor’s in Latin American Studies and a master’s in geology, Lewis is a major and company commander in the Marine Corps Reserves. Back in Dallas since late 2018, Lewis plans to take his third CASA case soon after settling back into his Dallas life.